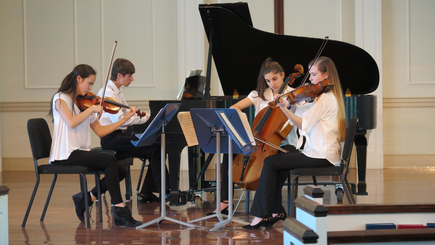 Franklin Pond Chamber Music, in collaboration with the Atlanta Symphony Youth Orchestra’s Chamber Players, will captivate classical music lovers at their Fall into Spring Finale Concert on the evening of May 5 at the Woodruff Arts Center’s Rich Auditorium. Thirty-seven exceptionally talented middle and high school musicians will present a diverse collection of works ranging from the traditional string quartet and piano quintet to a wind quintet and even the rare and beautiful cello quartet. Audiences will enjoy chamber works by Mozart, Brahms, Beethoven, Dvorak, Ravel, Prokofiev, and Rudolf Matz. Four students from the Talent Development Program of the ASO are playing together in a string quartet for the first time; another ensemble has been playing together for three years after first meeting at Franklin Pond’s 2015 summer intensive program. All eight chamber ensembles receive bi-monthly coachings with Franklin Pond’s premier faculty as well as master classes with world-renowned soloists in town to perform with the Atlanta Symphony Orchestra. The culmination of their studies is this Finale Concert event. Sunday, May 5, 6:00 p.m. in the Rich Auditorium of Woodruff Arts Center, 1280 Peachtree Street, NE, Atlanta 30309. Free and open to the public. Visit www.franklinpond.org or call 404-252-3479 for more information.